Not since the late 1990’s has the club had a team compete in the Munster Novice but this was changed on Sunday when Sharon Cantwell and the three Healy sisters, Lorraine, Sarah and Orla all took to the start line of the Ladies event. With the ground having cut up a lot from the juvenile races beforehand the going was very tough for all the athletes but fair play to all four ladies who put in a tremendous effort over the 4k event. First to cross the line for the club was Lorraine in 15th followed by Sarah in 24th, Orla 31st and Sharon 44th. The girls combined to finish 4th in the team competition with Lorraine securing a bronze medal with the Tipperary team that finished third in the inter-county competition. Orla was also entered in the U/23 category finishing 9th overall but was a vital member of the Tipperary team that won the silver medals in the team competition. 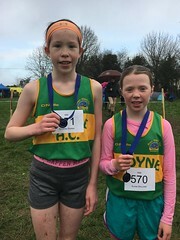 Well done to Lorraine and Orla on their Munster medals but equally well done to Sarah and Sharon on their performances.